A group of pupils from Parklands Girls’ School, Seacroft have taken part in an exciting final celebration of the Find Your Talent programme at London’s Southbank Centre, performing Firebird alongside Phoenix Dance Theatre Academy dancers. Six girls involved in Leeds’ Find Your Talent programme took part in the ‘Share Your Talent’ event on Thursday 22nd July which featured inspiring music and dance performances highlighting what can be achieved when young people are able to access arts and cultural activity to help them to develop their creative skills and talents. 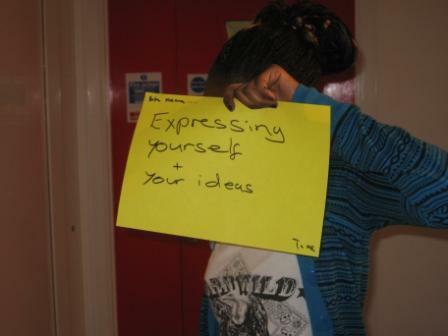 Young people from across England proudly showcased what they have learnt as a result of the 18 month programme. Groups from all the pathfinder areas performed including a fashion show by design students from Leicestershire; a Bhangra drumming bonanza performance by the Partnership for Urban South Hampshire (PUSH), and a gospel choir from Merseyside who re-arranged two classic songs that summed up their positive experiences on the Find Your Talent programme. A vibrant community youth theatre has been making waves in the heart of West Park. Organised by The Cardigan Centre and Extended Services Inner NW hub, two groups of young people (seniors and juniors) meet weekly during term time at the West Park Centre (Spen Lane) and Hawksworth Wood Children’s Centre to explore issues and themes that are important to them and their community. The young people from both groups develop their own material and create performances which take place twice a year in the local community and across the city. In 2009, over the Christmas period, the senior group took the theme of Alice in Wonderland and used the characters to create their own story. Delving into safety issues that they had experienced in their own lives, and inspired by Lewis Carroll’s classic text they explored themes such as ‘eat me, drink me’ (substance and drinking) and the disappearing of Alice – which developed ideas around how to meet new friends whilst staying safe. Coordinated by Hayley Briggs, the West Park Youth Theatre develops social skills, aspiration, confidence, self-esteem and gives young people a voice through the form of live theatre. There has been a positive impact on communities in the local area as a result of the pro-active engagement of young people from around the Burley and West Park areas of Inner North West Leeds. The performances have helped to challenge perceptions of what young people are capable of and have encouraged expression, motivation and innovation through the regular creative workshops in the area . For further information on local youth theatre groups across Leeds visit the Breeze Culture Network Hub. A group of aspiring journalists who meet regularly in Headingley Library have created the new issue of Chattix, a magazine ‘for young people, by young people’. The club is run with the support of Find Your Talent, Extended Services and Leeds Library and Information Service and is comprised of pupils from neighbourhood primary schools in the Headingley area. Featuring specially designed Chattix Creatures Cards, puzzles, recipes, a feature on ‘What Makes A Good Book?’, book and games reviews, cartoons, a short story (written by one of the group) and an adventure diary the Chattix project has been created to encourage children and young people to engage with literature. The new issue of Chattix is now available to download via this link. Ten young people from Leeds are set to take part in a prestigious cultural exchange in France which will include a presentation of artwork to Prince Charles. Their contribution will be part of a ceremony to commemorate Commonwealth soldiers who died during the First World War. The Lord Mayor of Leeds, Councillor James McKenna, will also participate in this high profile international event in Leeds’ partner city of Lille. 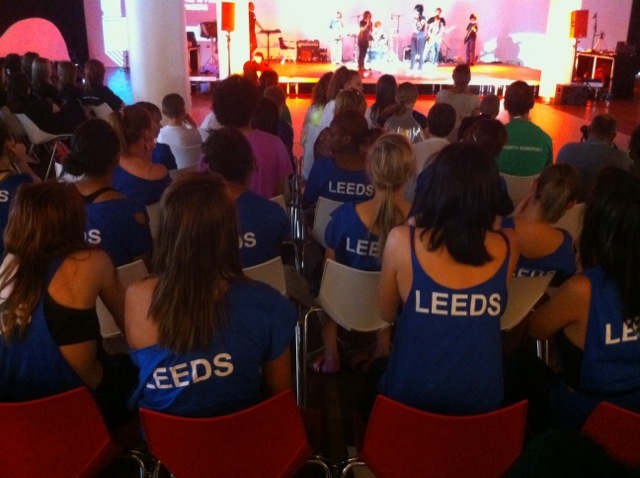 The Leeds group, aged 14-17, are from the Burley, Seacroft, Beeston and Morley areas. They have been developing a role as Arts Ambassadors for the city, supported by Youth Point at the Cardigan Centre as part of the Find Your Talent Leeds programme. They meet regularly to visit arts and culture venues in the city such as galleries, cinemas, and theatres. Thanks to a special invitation from Lille, the Arts Ambassadors will be representing the UK in France for two weeks from July 17th. Their artwork will pay tribute to soldiers who lost their lives in the trenches during the Battle of Neuve Chapelle. Comprising poems, photographs and drawings the collage will be combined with work by other young participants in the exchange programme from Italy and France. 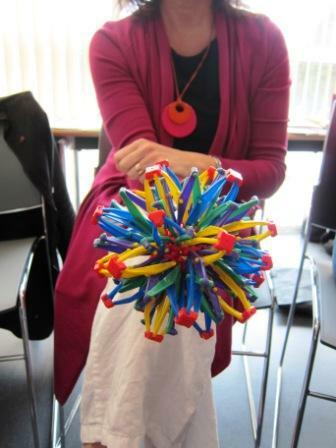 The cultural exchange will be led by Youth Point’s Andrina Dawson and takes place in Lille. 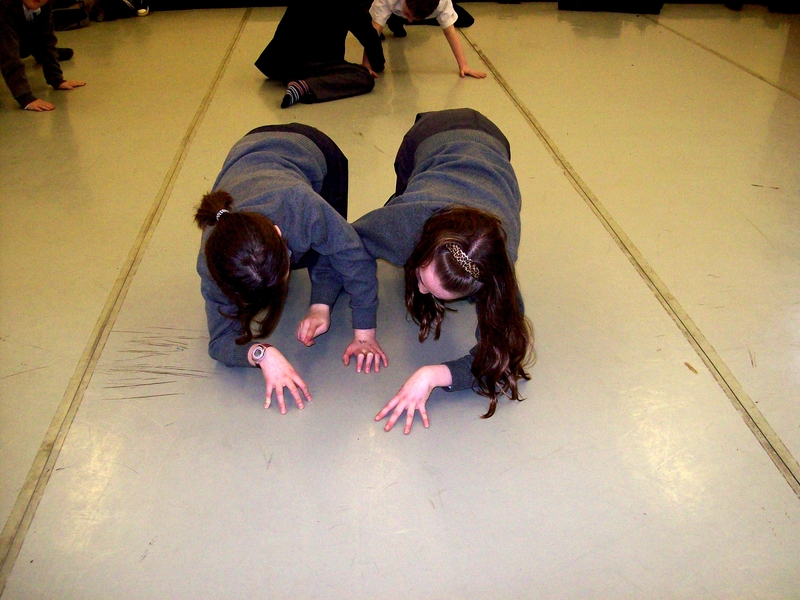 Activities will include daily workshops on dance, DJing, slam poetry and museum/gallery visits. 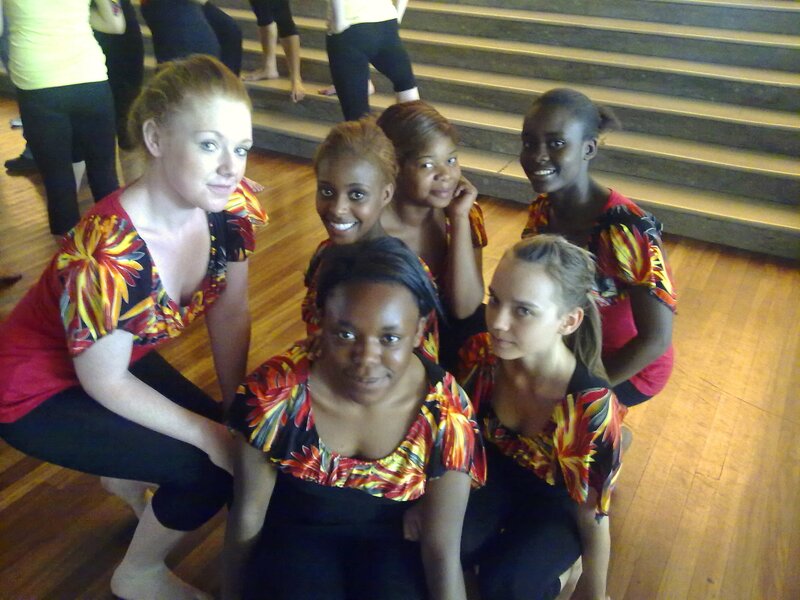 The workshops will culminate in a final performance produced alongside the other European exchange students. Many of those participating from Leeds had not had access to cultural opportunities before their involvement with Find Your Talent. Holmfirth artist Kate Woodfield hosted a regular workshop group at Gildersome Children’s Centre for parents and their children during July. The grand opening of the finished mural will take place at a celebration on 23rd July. The workshops have included a fantastic range of activities including storytelling and crafts which have inspired the creation of the mural. 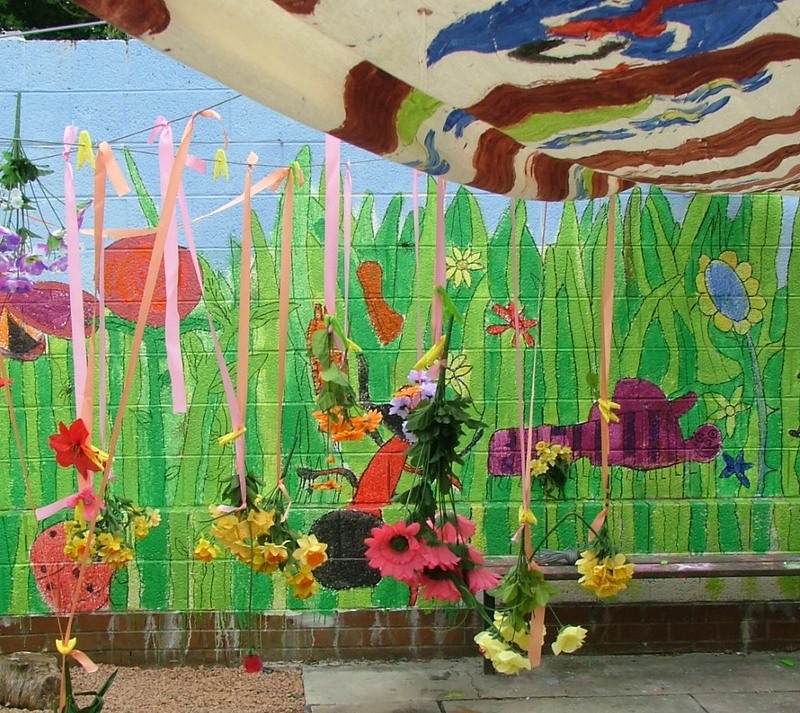 Parents and children have worked together to create acetate mobiles and a curtain with stories and photographs encapsulated in the plastic as part of the garden display. Bright printed cushions and a wicker scarecrow have also been produced for the Gildersome Scarecrow Festival 2010. The children’s centre has used this opportunity to work with the artist on enhancing their outdoor playspace. It has also supported parents in finding their creative feet and encouraged families to develop ways of applying their skills in the home environment. Earlyarts will be hosting a Professional Development Day at Temple Newsam – themed on Engaging Parents – on Friday 16th of July. Leeds’ Earlyarts will host a day of networking activities including two practical workshops – drama techniques with Tell Tale Hearts (children’s touring theatre company) and visual arts with Kate Woodfield – there will also be a presentation based around the Parent’s Arts Award. Earlyarts Professional Development Days are for arts, cultural and early years professionals who want to explore creative practices in their work with young children and families. The day explores case studies, connects colleagues with other networks around the region and helps gain new ideas and skills to put into practice. 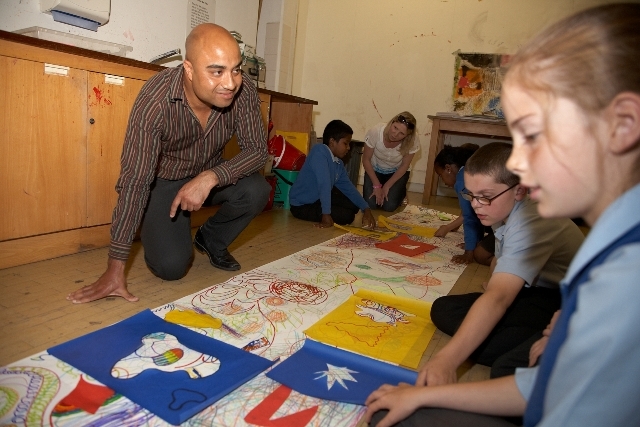 Pupils from St.Joseph’s Primary (Hunslet) and Gildersome Primary created vibrant collages and drawings alongside local artist Steve Pool on Friday morning at Leeds City Art Gallery. They were joined by Cllr Adam Ogilvie for workshops inspired by some of the vibrant abstract images on Leeds Gallery’s walls. Many of the children have now entered Friday’s creations into the Open Show competition. Pupils from across the city have created paintings, sketches and sculptures over the past few months in the run up to this year’s Open Show, which is supported by the national Find Your Talent programme. Hundreds of entries have already been submitted for this year’s event, organisers are encouraging even more families (young people, children, pre-schoolers and adults) to try out their artistic skills for Leeds Art Gallery’s August opening. The next Open Show workshops will be held at the gallery on Wednesday 7th of July for the city’s primary and secondary school pupils. There are also free additional Children’s Art Day workshops for families and their children with two all-day workshop events being held on 10th and 17th July. Children and Young People from various parts of Leeds have taken part in local workshops, especially in areas such as Seacroft, Inner North West, and Morley which are target areas for Find Your Talent in the city. By encouraging families to participate and enter Open Show the gallery hopes to expand on the vibrant entries that have already been received for this year’s event. Open Show (with support from Find Your Talent) is open for the first time to young people aged 18 and under. The competition is open to anyone from the Yorkshire region aged 0 to over 100. 200 selected young entrants will have their work professionally hung at Leeds City Art Gallery during the summer holidays. The works will be chosen by a panel of young people aged 16-19 from the Leeds Met Gallery Young Curators Group. Click this link for information on how to enter. Under The Parasol is an early years theatre project by the Tutti Frutti theatre company that will be taking place in Morley’s schools and libraries and at the Little London Children Centre throughout July. There will also be a performance at Shine in Harehills. Based on the Smarties Book Prize winning novel Hue Boy by Rita Phillips Mitchell, the touring theatre performance explores themes of family, self-esteem, community, food from other cultures, healthy living and fathers and sons. The workshops encourage children to create and perform their own stories and develops literary skills. 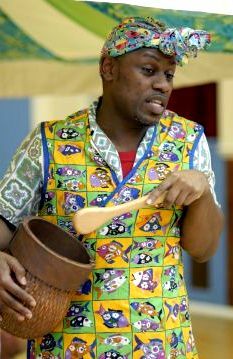 A heart-warming tale set in a Caribbean village, Hue Boy is performed by the actor Stewart Thomas to children aged 4-7. Set in a village in Belize Hue Boy’s dilemma is that he is smaller than the other children his age, he has to eat healthy food to make him grow taller. The story follows Hue’s journey of exercise, food and potions to make him grow. With a stunning theatre set by the designer Alison Heffernan, the children from Morley, Little London and Harehills will be invited to sit in the storytelling zone and enjoy this unique interactive experience.